taking a page out of Bobby's book; I hate you. Based upon the size of that Corning Ware dish, I'm hoping you nixed the "individual" aspect of tonight's dinner Nate! Mmmm! I did mike, because i used tater tots instead. 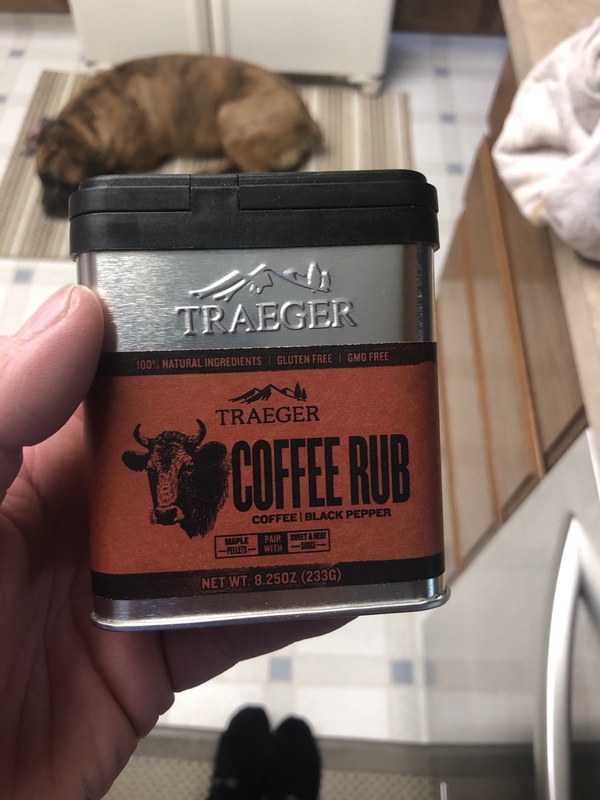 Darn Tate, I would have thought you would have whipped up something special for her. Meal fit for a Queen and her family for sure. She only cried twice, so I'll just have to try harder next time Really great group of 15 overall, all friends since grade school! Tate, I would weigh 400lbs if I lived near you just copying all that good stuff. Thank you very much. She's always the party planner for everyone else and my wife really wanted to do something special for her for once, so it's a good thing I didn't screw it up! Ken, you can be a judge and cover poor taste since you have an affinity for H & 1911’s! I’ll cover good taste since I like Jeeps and Glocks. Together we got this, how’s that for teamwork Don? Tate that looks really good. Small bites are a lot of work compared to family style dishes. Yes they are much more work, but I enjoy creating all the same. My youngest and I tried kabobs tonite. Needed a little more veggy but was overall great! Had burgers and tube steak too, was great!! hmm simple. I like it. I'll give it a try. 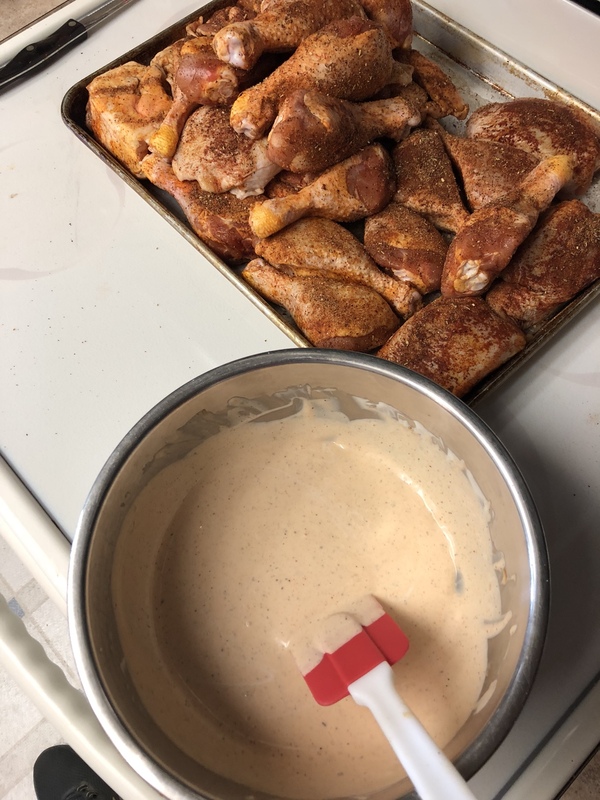 I use a basic dry rub or get the pre season packages of chicken from the store. 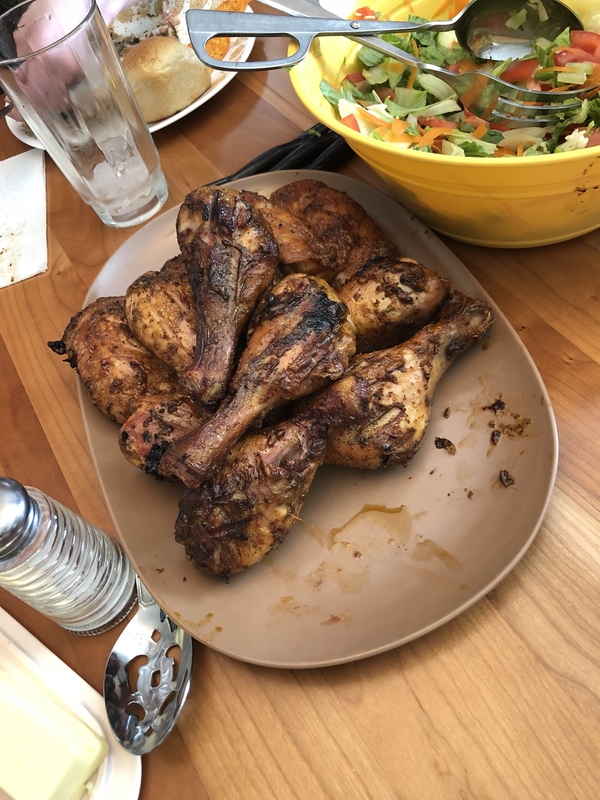 Easy enough but super juicy when finished. I made a taco salad for dinner, and i used this recipe as a guide. Found this recipe and gave it a try.......and all i have to day is damn this was good. Name sounds stupid but the rest looks fantastic. 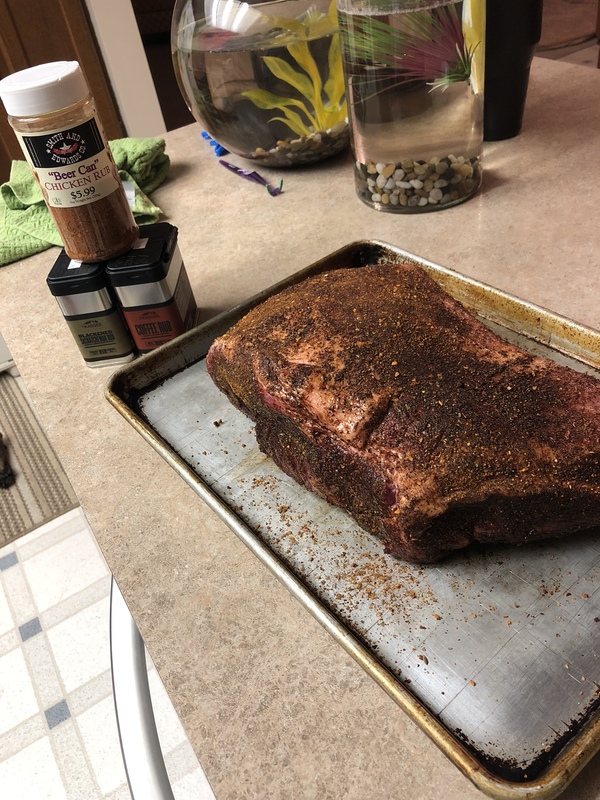 So I purchased a brisket at Costco last week. 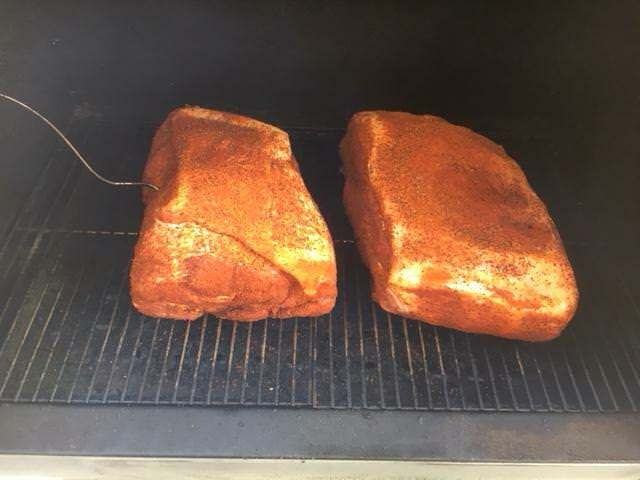 Cut it in half and smoked it Saturday. 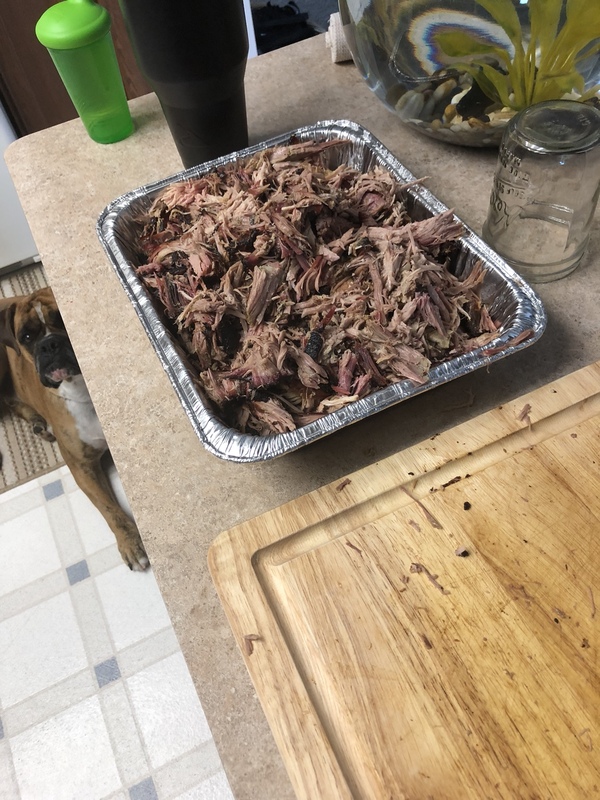 Well the wife and grandma did, I went to work and left them with simple instructions with spray meat every 45 min with 225 degrees on the GMG. 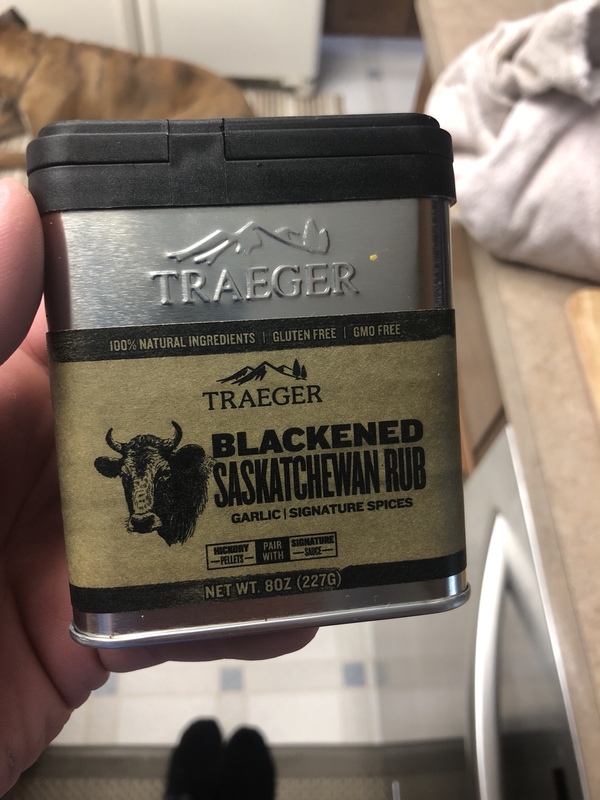 Used this stuff at 50/50, smoker since 10:00 am till 12:45 am. 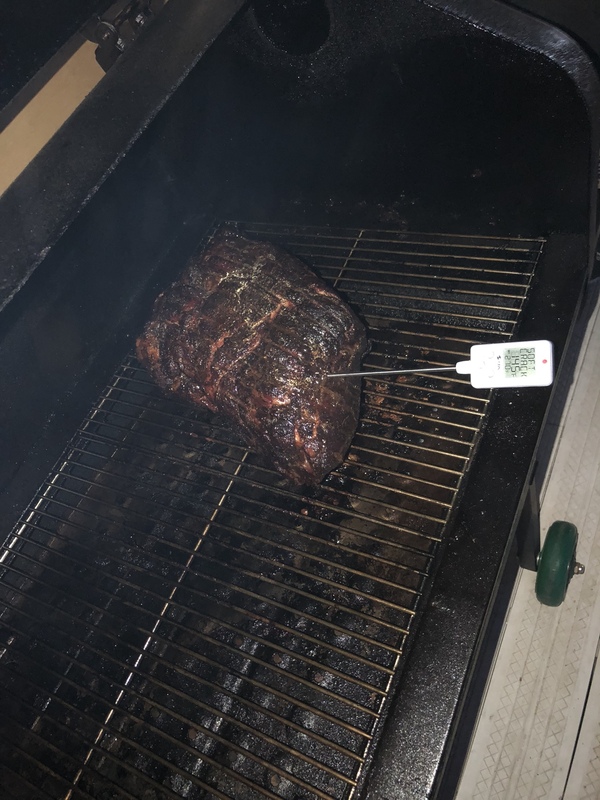 Waiting till the meat hit 165 wrapped and back on smoker till it hit 205. The point cooked at a much faster rate for sure. so last weekend while up at Wendy's parents, I was informed of a shrimp farm just south of me by like an hour. Well yesterday I researched them and placed an order for 2lbs with a pick up of this afternoon. let me just say, this place is "IN THE COUNTRY".....probably like 5 miles from a paved road! So the 2 lbs of shrimp that I got from him were deheaded and sautéed in some garlic butter and were served with some fried cabbage with bacon. the cost of the shrimp was $18 per lb and they are 20-24 shrimp. I normally pay $10 per lb and get a 4lb bag of 13-15 shrimp from Costco. 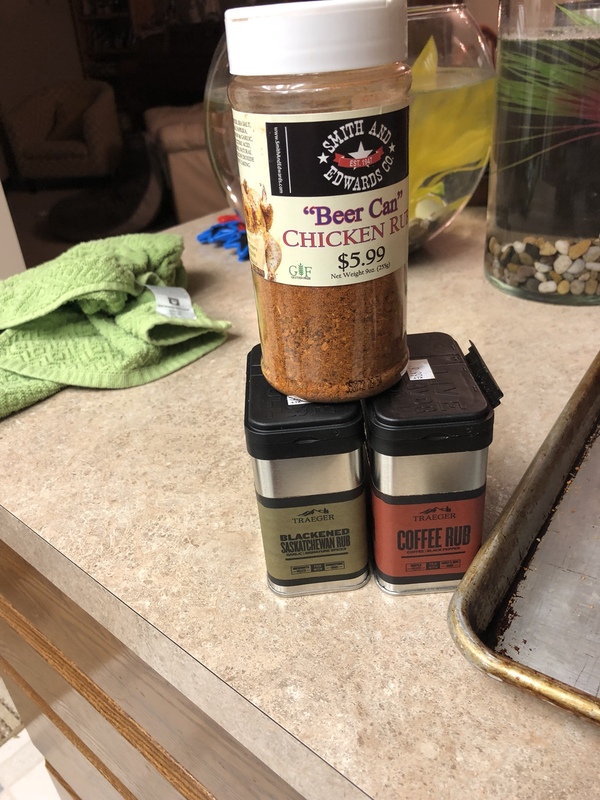 Truth be told, I am all for supporting local business, but not sure if I can do it at double the cost for a smaller take home? I will give them another try and make a determination from there? oh yeah I did finish my second bacon this evening which is chilling down in the fridge, to get sliced up tomorrow. Since I’ve been doing low carb I’ve eaten it a lot. I really like it. 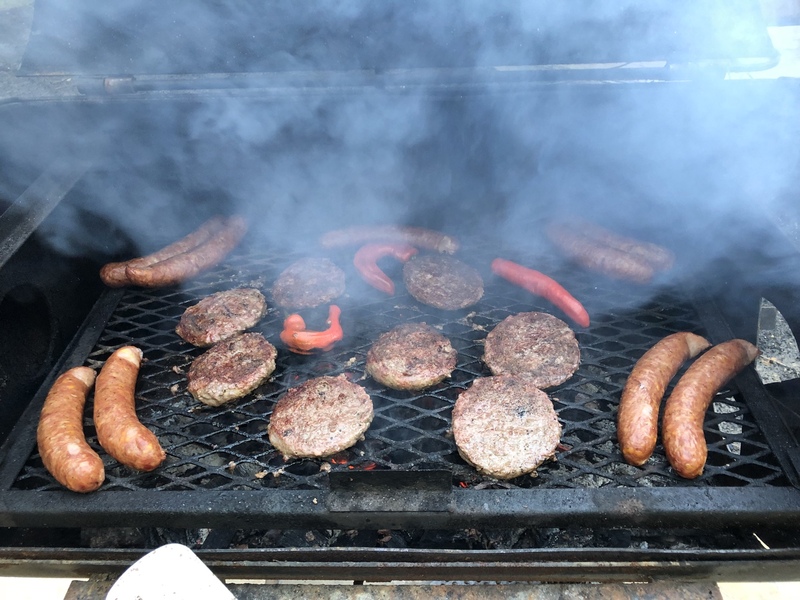 We are just doing burgers, tube steaks, lots of dip and chips. Great fireworks display we can see from the house to boot! Smoked brisket at the cabin today. 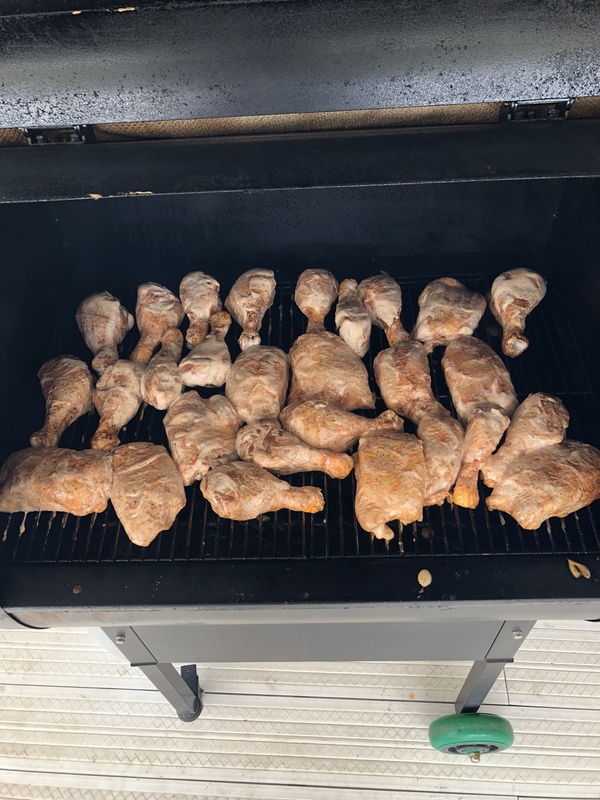 About 10 hours in not quite done but ran out of sunshine. It was at 183 so it was cooked and tender and deliciously juicy and all but not quite as much as it could have been. It looked a lot like the one up a few posts and was devoured quickly. 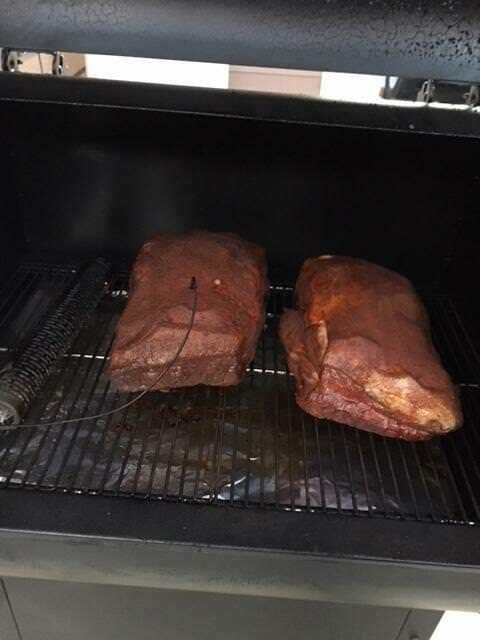 Rained off and on this afternoon and other than a couple hours before the sun hit the panels the solar ran the smoker without a hitch. Nate, I wrapped them once I pulled them at around 160 and stuck in oven at 225 overnight. Turned out nice and moist, just finished pulling them an hour or so ago. So in the pic are they wrapped or no? What did you wrap them with? Not wrapped in the pic, foil pan in oven.